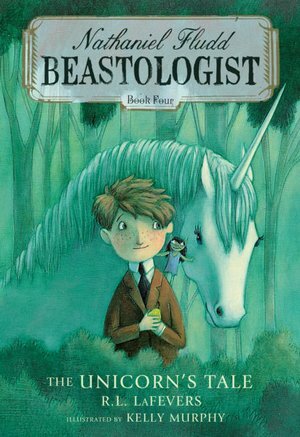 First reviewed in 2009, RL La Fevers's Nathaniel Fludd: Beastologist series is the PERFECT next step for readers ready to move on from Magic Tree House! Rich with mythological creatures, adventure and airplanes, this series is wonderfully written and illustrated. And, all 4 books are in paperback! Before I start slinging superlatives, I need to thank RL La Fevers, author of the equally fabulous series for older readers featuring one of my top two favorite girl detectives, Theodosia Throckmorton, for creating Nathaniel Fludd and writing his world into existence. Special commendation goes to you for introducing a new series written at the much ignored third grade reading level while at the same time refusing to talk down to the reader by presenting historical, geographical and cultural information in a fascinating, bite-size fashion. And, thank you to Kelly Murphy, illustrator of Elise Broach's Masterpiece, for your gentle, intriguing illustrations that make the book feel complete. I don't know where to begin writing since this book hit so many sweet spots for me, from maps to glossaries and gremlins named Greasle, but I'll try my best. As Flight of the Phoenix opens, it is 1928 and we find ten year old artist Nathaniel Fludd drawing in an office lobby as he waits to hear news of his traveling parents whom he has not seen in three years. When he learns that the airship Italia (see the glossary) crashed on the ice near the North Pole and his parents as well as most of the crew have been declared lost at sea he is devastated. He then faces another blow when his governess, Miss Lumpton, happily and hastily accepts the "Tidy Sum" that the Fludds have left her and departs. Almost alone in the world, Nathaniel takes a lonely train trip to his father's cousin's house in Batting-at-the-Flies in the North Country. Being an orphan is never a good thing but essential to so many good stories and this proves the case when Nathaniel is deposited in front of the imposing home of PA Fludd, Beastologist (as the plaque above the door indicates.) Much to Nathaniel's surprise, a tall woman with "lots of elbows and knees and angles poking about" who looked very much like a "giraffe with a mane" opens the door. He is even more surprised when he learns that she is Phil A Flood, his father's long-lost cousin. As she explains, "Phil is short for Philomena. The A is for Augusta. My parents couldn't decide between Latin or Greek. I'm sure you can understand why I go by Phil. You may call me Aunt Phil, if you prefer." From this point on, the story takes off almost as quickly as Aunt Phil's old Sopwith Platypus (see the glossary). 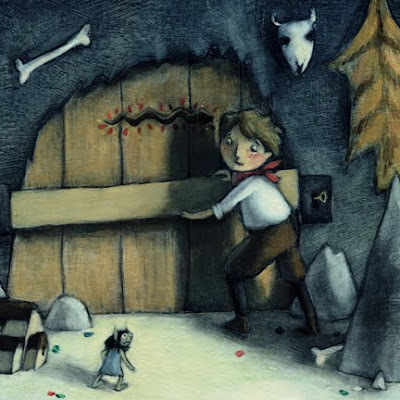 La Fever does a graceful job of keeping the story hovering around a third grade reading level while sprinkling historical, mythical and adventurous details here and there along with some great vocabulary. 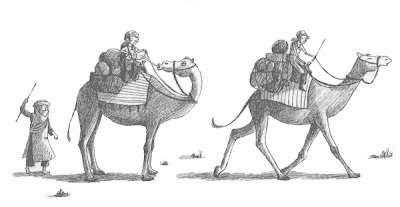 Nathaniel is temporarily left to the care of Cornelius, a talking dodo (glossary entry), who seems convinced that he will be more of a hindrance than a help to Aunt Phil, who is preparing to leave on an adventure, without him, Nate assumes. After spending a sad night alone in his room, Nate is gently awakened by Aunt Phil who tells him to pack his bags. Over the course of their journey Nate learns about his descendants. The Fludds were and are explorers, adventurers and mapmakers who, over the course of their travels discovered then sought to protect the many rare and mythical beasts they encountered, thus becoming beastologists. As Aunt Phil explains, the first Fludd of record, Sir Mungo Fludd (see the glossary) "became obsessed with Marco Polo's account of his travels to the Orient. He decided to retrace the journey for himself, only this time with surveyors and cartographers (see the glossary) so they could produce a map of the world." This map, The Geographica, A Map of the World, has disappeared along with Nate's father, however another of Sir Mungo's maps hangs in the room that Nate slept in at Aunt Phil's, beautifully reproduced in the book by Kelly Murphy. I even learned a cartography term, compass rose (see the glossary). The Fludd compass rose has a sketch of a dod in the middle (Cornelius?) and I have no doubt that the connection between the Fludds and the dodo will be explained in future books in the series. Sir Mungo's great-great grandson recorded all of his knowledge in The Book of Beasts, which Aunt Phil carries with her everywhere. And where is it that Aunt Phil and Nate are headed? To Arabia, by way of Budapest (see the glossary) for a fuel stop, to assist in the birth of a new phoenix (see the glossary), something that happens every five hundred years. The last rebirth witnessed by a Fludd was in 1428! After run-ins with gremlins (see the glossary) and Bedouins (see the glossary) and a potential book thief, Nathaniel, with only Grealsle the stowaway gremlin to help him, sees the phoenix through its rebirth and rescues Aunt Phil. 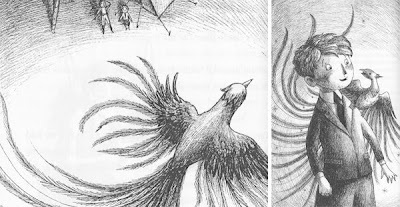 One of my favorite passages from the book occurs after the phoenix has successfully hatched and, singing its beautiful, entrancing, calming song, lands on Nate's shoulder to thank him. When their gazes meet, it is as if the "phoenix were looking deep inside him, taking his measure. Nate felt naked, his every secret hope and fear painfully laid bare before the phoenix's knowing gaze. But, as he continued to stare into the phoenix's eyes, Nate noticed something else. His hopes began to glow, filling up and spreading out until there was hardly any room left over for fear. His exhaustion and discouragement were burned away, like clouds before the sun, leaving only his possibilities behind." I'm sure nothing can beat face time with a singing phoenix, but I have to say that I felt a little bit of the phoenix's glow as I turned the last few pages of Flight of the Phoenix. Here is a sneak peek at the cover for Book 2, The Basilisk's Lair cover and is out now! Book 4, The Unicorn's Tale are out now! This sounds wonderful, and I bet my kids will love it. But really, this rehashed storyline is starting to drive me nuts. Of course the parents had to be dispensed with immediately (and the governess too)! Sure enough, off to live with distant quirky relatives the kid(s) hasn't met before. Surprise, it's a big old house with magical secrets! It makes me wonder if the big publishers have the same generic outline they send out to all of the talented writers and illustrators in hopes of creating the next Harry Potter (the equivalent of the big labels' manufactured boy bands?). What's remarkable is that some of those teams manage to craft great entertainment (and this does sound great) despite the derivative main theme. I agree completely with your point, and I have often thought long and hard about this phenomena in children's literature. I am sure that some great thinker/writer somewhere has written about the necessity of doing away with authority/adults in kidlit and has some insight into why this is essential to a good adventure story - be it fantasy or otherwise (Mrs Basil E Frankweiller is reality based, but adults are banished, mostly from the story.) And, really, I think there are only 7 or so essential themes for any work of fiction, so this shouldn't be too surprising, although frustrating. Remember this, though: We are old, experienced analytical types who can spot these redundancies. Kids don't realize these repeating themes and settings so much. I do worry, though, that, if this is what the bookshelves have to offer, then this is what readers will come to expect, thus missing out on a component of experimentalism, innovation and possibly even variety. I think this book sounds interesting and I like the pictures. I'm a 9-year-old boy and I have just started a book review blog, so click on my name to see my reviews. I'd really like to get more followers on my blog! My 6 year old daughter and I have really enjoyed these books - we just finished the latest, The Unicorn's Tale. One thing I like about this series is how they incorporate mythical beasts from many different cultures. Also the historical setting has brought up some interesting topics in our house - like what was the War to End All Wars, and why it isn't called that anymore. My daughter loves adventure stories and I am getting very tired of the absent parent concept. How about a family that adventures together? Excellent! I am so glad to hear that historical aspects from the book are encouraging thoughtful questions from your daughter - especially as a 6 year old! I have got to read the rest of these books. I'm sure my 6 year old would love them, too. It's so hard for me to keep up with books in a series when there are so many great new books being published at the same time! My six-year-old and I each read these independently and we both enjoyed them. (I generally pre-read books to make sure they will be okay and then hand them over if they are.) I think these are somewhat better than some other series out there. They are definitely page-turners and the characters are interesting, if not complex. I found Nathaniel a bit whiney for my taste in the 4th book, but my son was sympathetic. :-) I love that so much is expected of Nathaniel, and that he experiences worry and fear, but he is able to accomplish things that are not based upon having extraordinary brains or athleticism. He decides it is important to try hard and so he does and he sees it through. We are eager for the next one! Now I'm curious what you think the seven themes for books are. I too am getting tired of absent parents but you're probably right, children don't notice it much. Thanks for the link Tanya.